All of this tutorial will take place in the Settings tab on your Voiceflow Canvas page. You can access the Settings tab by clicking on the Settings text in the top left. When you make every session a new session, all the variables in your skill, and the user's actions in the last session will be wiped. Your skill will act as though this user is a brand new user. This is useful when your skill is a service about speed such as booking hotels, or ordering a pizza. To enable this setting simply hit the toggle switch labeled "Restart Every Session. 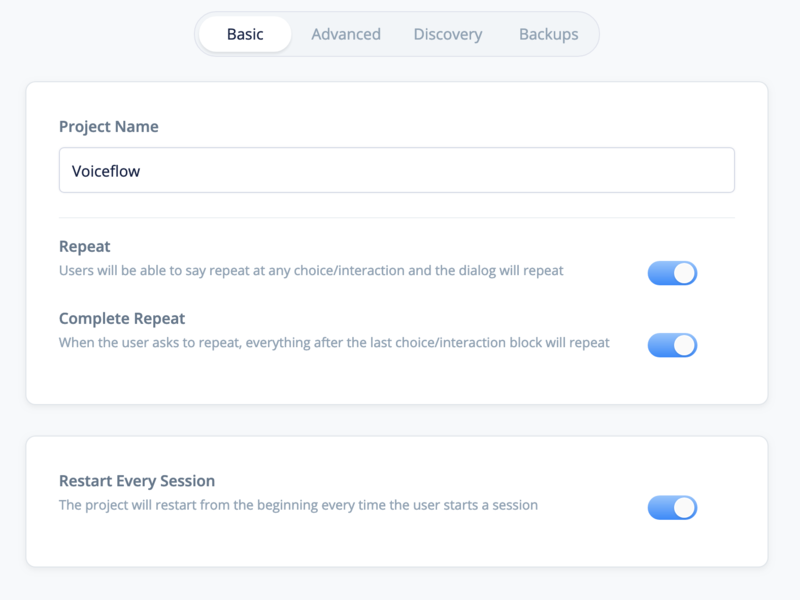 With Voiceflow you can choose to have your user start from where they last ended their previous session in your skill. For example, if you are an interactive stories skill and had a user who left at Chapter Two, you could have the user automatically start again at Chapter Two the next time they open the skill. To do this, turn off the 'Restart Every Session' toggle. Sometimes you may want to give users the choice whether to restart their session, or resume. You can do this with Voiceflow using the 'Resume Prompt' toggle. 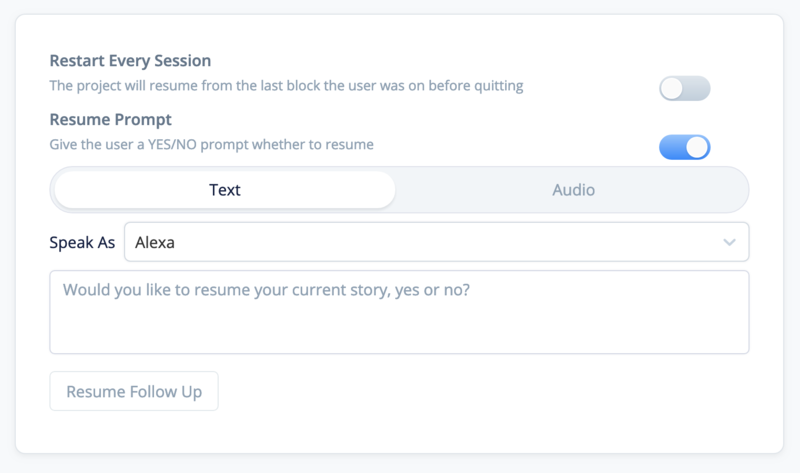 Within this section, you can enter a custom response you would like Alexa to greet returning users with when they re-open your skill, and have a previous session log. Similar to a Speak block, you may either enter Text or have Alexa play a pre-recorded MP3 file. Would you like to resume your current story? Would you like to continue with your previous session? Would you like to continue your current search? That's it! If we missed anything, or you still have questions, feel free to message our team using the blue intercom bubble in the bottom right corner.